I just published a post that, as a baker and cat lover, I thought you might enjoy. And no - we don't want pictures of naked ladies, we want hunky farmers! Puhleeeeease! Downloading photos now. Will post SOON--I promise! P.S. 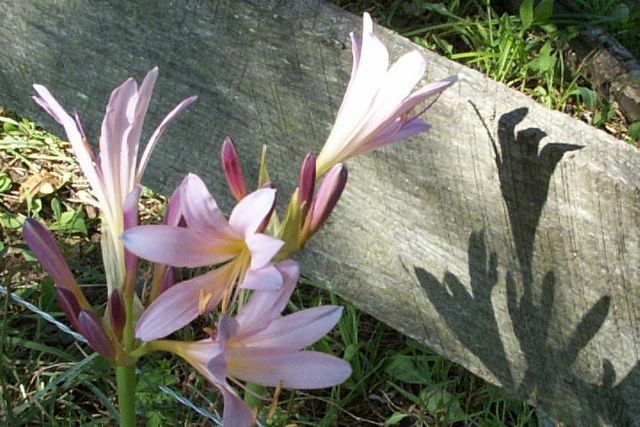 They really are also called Naked Ladies! Really! Farmgirl just emailed me privately to let me know she was left a little breathless by her surprise visitors. Sounds to me like she's been riding those gorgeous studs. I hope she went easy on them. What you need is a piece of CHOCOLATE CAKE! ooo, hunky cowboy, studs, naked ladies and choc cake! Sounds like Missouri is the place to be. Love it here on the farm. You never know who is going to show up and what you are going to see or hear. naked ladies dancing at the edge of dawn????? wow...that would make a great title for a song...or a book...yup!!! i think it IS a book....and these naked ladies and hunky mavericks go hand in hand...or....welll...i think i best quit now....heh heh!! !